In 1942, Bougainville was occupied by the Japanese, and was used as a base to attack Guadalcanal and other Allied territory.The 3rd Marine Division landed on the west coast of Bougainville in November 1943, and shortly afterwards the Battle of Empress Augusta Bay was fought between cruisers and destroyers of the U.S. Navy and the Imperial Japanese Navy. The Americans routed the Japanese and were never bothered again in this area by the I.J.N.It took a concerted Allied land offensive between November 1943 and April 1944 to occupy and hold the part of the island along the western shore in an area called “Torokina”.The Americans set about establishing a wide defensive perimeter, draining swamps, and building multiple airfields for defense, and for attacking the Japanese on New Britain Island. 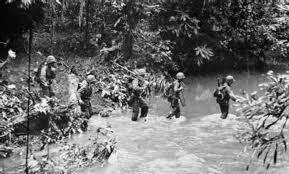 The Marines were replaced by US Army troops.The Japanese infiltrated the mountains and jungles of Bougainville, and launched a counteroffensive against the Americans in 1944. The critical focus of their attack was at a place called “Hellsapoppin Ridge” by the Americans.In repulsing this attack, the American soldiers and airmen broke the back of the Japanese Army on Bougainville. The survivors retreated to their bases on northern and southern Bougainville, and the Americans left them to “wither on the vine” for the remainder of the war.
. In 1945, the Australian Army took over occupation from the Americans, and Australia resumed control of Bougainville and Papua New Guinea, which became a United Nations trusteeship. The remaining Japanese on Bougainville refused to surrender, but rather held out until the surrender of the Japanese Empire on 2 September 1945. They were then commanded by the Emperor to surrender to the Allied Australians, Americans, and New Zealanders, and they were then repatriated to Japan. For War buffs, this island 100 km north of Buka has an American WWII airstrip and other relics including a WW2 swimming pool. There is a guest house there. You can hire a speed boat or catch one of the regular shipping boats that travel out that way. If I was you, time your visit well, hire a speed boat out there and catch the regular ship back. You can do this for Catarats as well. During World War 2, two groups of Australian Coast Watchers operating independently of each other played a decisive part in the battle for Guadalcanal and the subsequent Allied advance through the South Pacific. The first group was led by W.J. [Jack] Read, an assistant district officer from near Buka Passage, a one kilometre wide sea passage separating the islands of Buka and Bougainville. The second group was led by Paul E. Mason, the Inus plantation manager 75 kilometres North West of Kieta in Bougainville. The concept of the Coast Watchers originally began in 1919 when selected personnel were organised on a voluntary basis to report in time of war any unusual or suspicious events along the Australian coastline. This concept was quickly extended to include New Guinea [not Dutch New Guinea] as well as Papua and the Solomon Islands. In 1939 when World War 2 commenced, approximately 800 Coast Watchers came under the control of the Royal Australian Navy Intelligence Division. Lieutenant Commander Eric Feldt had operational control of the Coast Watchers in the north eastern area of defence which encompassed the Australian Mandated Territories, Papua, the Solomon Islands and Australia. The next morning, the Japanese attacked Malaya but this was before the attack on Pearl Harbour because of the International Dateline. The Emperor’s Imperial troops then invaded Hong Kong, the Philippines and continued sweeping all before them. Guam, Wake Island, the Netherlands East Indies, Rabaul, Malaya and Singapore, the colonial jewel of the British Empire. An enemy had arrived on Australia’s doorstep and the country was now at war with both Germany and Japan. Rabaul was the peace-time capital of the mandated Australian Territory of New Guinea. The 2/22 Battalion of about 900 men and 38 officers which formed the bulk of Lark Force had arrived on Anzac Day 1941. By December this number had increased to about 1,400 and was tasked with the impossible job of defending the capital. When the Japanese attacked Rabaul on 23 January 1942, the small garrison was overwhelmed and within hours Rabaul was under Japanese control. The Japanese made a public announcement of the capture of Rabaul on the afternoon of 24 January. It was now up to the Coast Watchers plus the Independent Company men on Bougainville, the Government officers transferred into ANGAU (Australian New Guinea Administrative Unit), the New Guinea Volunteer Rifles (who were doing much of the monitoring of the Japanese in Lae and Salamaua) to be the eyes and ears of the Allies. Another group of ‘spotters’ [New Guinea Air Warning Wireless Company] also stayed. Keith McCarthy, Alan Timperley and Ivan Champion and others who did so much to report what had happened after the fall of Rabaul and rescue the remnants of Lark Force were all pre-war field officers of Papua and New Guinea. The spotters had posts at Kokoda (from about February 1942), on the north coast of Papua, and in the Milne Bay Islands. They alerted Moresby to incoming aircraft and the landings at Buna and Gona. Early in July 1942 information about the construction of a large Japanese airstrip taking place on the island of Guadalcanal hurried the American amphibious move into the southern Solomons and, on 7 August, American forces totalling 19,000 mostly the 1st Marine Division, began landing on Guadalcanal and nearby Tulagi. The small Japanese garrison of 2,200 on Guadalcanal and 1,500 on Tulagi were taken completely by surprise and quickly scattered. In the days following the landings, Japanese air attacks severely interfered with the unloading of supplies. To make matters worse, the Japanese achieved a stunning naval victory off Savo Island in the southern Solomon Islands during the early morning of 9 August. A group of powerful Allied cruisers was almost annihilated by a Japanese force obliged to travel hundreds of miles through waters that were patrolled by Allied reconnaissance aircraft. Given the air strength available to the Allies due to the presence of American aircraft carriers it was amazing that the Japanese were able to escape after the battle almost unscathed leaving more than 1000 dead or missing Allied seamen in their wake. This defeat caused the American Admirals Fletcher and Turner to withdraw their forces leaving the Marines ashore on both Guadalcanal and Tulagi short of supplies and isolated. American engineers rushed to complete the partially constructed Japanese airfield now renamed Henderson Field and as soon as the airfield was completed, a squadron of 31 Marine aircraft arrived to provide direct support and air cover. Towards the end of August aircraft strength on Henderson field had been increased to almost 100. Throughout the island, clashes between American and Japanese patrols became more frequent and intensive as Japanese reinforcements and supplies began to arrive on Guadalcanal via the ‘Tokyo Express.’ This term was used by the Americans to describe the nightly runs by Japanese destroyers and light cruisers down the ‘slot,’ [the channel between the north-eastern and south-western chains of Solomon Islands] With the Americans also pouring men and supplies onto the island, the fighting on Guadalcanal escalated from short sharp exchanges between each others patrols into a larger vicious and hard fought battle for the control of what was now a strategically important island for both sides. To the Japanese, Guadalcanal was ‘Jigoku no shima’ [hells island] and to the Americans it was, ‘our time in hell’. Slowly, the American forces gained more and more ground wearing the Japanese forces down. By the end of October, a large Japanese naval force had assembled in the Caroline Islands and began moving to launch a massive counter-attack to retake Guadalcanal from the Americans. On the southern coast of Bougainville, the two groups of Australian Coast Watchers led by Read and Mason independently radioed early warnings to the United States Navy of a number of Japanese warship and aircraft movements enroute possibly towards Guadalcanal. Read from his position inland reported twelve large passenger ships, each over 10,000 tons headed south-east. Mason, from his position at the southern end of Bougainville on 10 November 1942, reported the passage of sixty one ships comprising six assorted class cruisers, two sloops, thirty three destroyers, seventeen cargo, two tankers and one passenger liner of 8,000 tons. Forewarned by these reports, the US forces launched air and sea strikes against the enemy shipping resulting in a major defeat for the Japanese and shattered any hope of their retaking Guadalcanal. Now unable to resupply their forces, Japanese high ranking army and navy staff from the Imperial General Headquarters conceded that they had no hope of winning this particular battle and proposed Guadalcanal be abandoned and a new defensive line be established in the central Solomons. Emperor Hirohito gave permission for his troops to withdraw and, from 31 December, the Japanese began gradually withdrawing from the contest as to who owned the island and began evacuating their remaining forces from the island which they completed by early February 1943.As soon as it was confirmed the Japanese had left, US forces began preparations to continue their move slowly northwards towards Tokyo. It had taken a little over 6 months of vicious bloody fighting before the Americans were finally able to call the island theirs. Most American military historians write about Guadalcanal as a victory due to the tenacity and bravery of American soldiers, sailors and airmen which of course it was, but very rarely do they mention that it was the vital contribution of the Australian Coast Watchers which made the victory possible. Fortunately for recorded history, the Australians were paid a high tribute when the United States Admiral of the Fleet, William. F. Halsey Jr, said: ‘The Coast watchers saved Guadalcanal and Guadalcanal saved the South Pacific.’ Additional praise was sent by other important American military commanders. On Saturday 3 April 1943, copies of congratulatory messages from Guadalcanal were sent to the Coastwatchers: ‘Have much pleasure relaying these to messages to Coastwatchers also thanking you on behalf of Naval Intelligence. Keep up the good work.’ From Admiral Turner, US Navy: ‘Large share credit our success against enemy due to splendid men in Coast watching service.’ From General Patch US Army: ‘Your magnificent and courageous work has contributed in great measure success of operation on Guadalcanal.’ With just these four congratulatory messages alone, there is no historical excuse not to give credit where credit is due. One significant effect of the fighting on Guadalcanal was that it committed and then destroyed troops, aircraft and ships that would otherwise have been used in the Kokoda and Milne Bay campaigns. A very vital factor that allowed the Coast Watchers to operate throughout the Pacific was the cooperation of the local people. It would have been almost impossible for the Coast Watching operations to have started, let alone continued, without their cooperation. As the influence of the victorious Japanese military spread throughout the islands, the Japanese exploited conflicts that began between the natives who enthusiastically or reluctantly supported the Japanese and those who remained loyal to the Allies. By December 1942, the Japanese in the southern part of Bougainville in the Buin/Kahili area began applying pressure on the Bougainvillians to disclose the whereabouts of the Australians they knew were somewhere on Bougainville. Propaganda was spread amongst the natives telling them that Nippon was now the new government and they would receive many good things if they cooperated but if they didn’t help the ‘man bilong Japan’ they would be killed. As a result, an ever-increasing number of natives, either out of fear or willingly, became pro-Japanese creating an increasingly hostile environment for the Coast Watchers to operate in. One prime example is that of the tribal Chief of Sadi, a coastal village, who began fully cooperating with the Japanese. Members of his tribe were given arms and ammunition to hunt down the Australians. In the southern part of Bougainville, the people remained friendly until Kieta, the capital, was occupied by the Japanese on 18 February 1943 and the problem of allegiances began to appear there too. Old feuds were an additional factor that caused friction between the various tribes choosing sides and were used as an excuse to fight each other. During this turbulent time, Coast Watcher Jack Read had attempted to assure the natives on Bougainville the Allies would be back to liberate them but the Japanese had been in control for quite a while and there were still no signs of the Allies returning. Tashiro, who would have been under the minsei-bu commander—officer in charge of civil affairs in Rabaul—began a propaganda campaign to ensure the natives continued to join the Japanese. Part of his campaign was to convince the natives that the old days were gone forever and pointed out the number of Japanese airfields and bases that were expanding on the island. With his argument, he mixed in allusions to past white exploitation which had some basis of truth and the more he talked, the more the natives listened. Who was this mysterious Japanese civilian who was alleged to be stirring up the natives and giving the Coast Watchers and members of No 3 section headaches? He deserves a little more attention than just a mere line or two in a few books about the Coast Watchers. Tashiro Tsunesuke [the Japanese put the family name first] had migrated to Rabaul in 1917 at aged 16 to trade in Copra and engage in coastal transport. On Bougainville, he had been a popular trochus sheller and trader. In March 1941 he went back to Japan on a business trip aboard the last liner prior to the outbreak of war between the Japanese and the Allies. He was conscripted 13 December to serve in the navy as a gunzoku [civilian] in the Japanese Navy Civil Administration at a time when the navy was recruiting Japanese civilians who had experience in the South Seas. Tashiro returned to Rabaul with the Japanese forces on 23 January 1942 assigned to the 8th Base Force which controlled operations in New Guinea from Rabaul. Paul Mason and Tashiro had been friends before the war and, even though Tashiro knew Mason had become an enemy spy, he was never too serious about interfering with Mason’s activities although he knew was operating in the area. With Tashiro’s local contacts, expertise in dealing with the natives and the pro-Japanese loyalties of many of the tribes, he could have caught Mason had he really wanted to do so. Nor was there any real effort at the time by the Japanese to round up civilians or the 25 commandos of the 1st Independent Company under Lt Mackie who were still on Bougainville. Perhaps the reason for their half hearted attempts was that the Japanese failed to make a connection between their losses at Guadalcanal and the presence of the Coast Watchers. The harassment of the Coast Watchers by the Black Dogs has also been attributed to Tashiro by Lt Commander Feldt in his excellent book about Coast Watching but there is no positive proof of Tashiro’s actual involvement with these renegade natives. There is a possibility that Petty Officer Harada was, in fact, the man responsible for the creation and use of the Black Dogs to pacify the area. Nothing was known at the time about Harada and Feldt and other historians may have mistakenly associated Tashiro with the Black Dogs simply because he was well known in the area and in an excellent position to influence the natives. Another possibility is that Harada was a member the Tokkei-Tai, the Navy secret police which was the Navy’s version of the infamous Kempei-Tai. The Tokkei-Tai was attached to Navy units and served as Colonial police in some Pacific areas. They were responsible for recovering and analysing information and for the execution of undercover operations. It is known that one of Harada’s assignments was to recruit natives to help him track down and eliminate all anti Japanese elements and even Tashiro himself stated he was deeply impressed with Harada’s detailed knowledge of the operations of the Europeans on Bougainville. After the war ended and the Japanese surrender, there were 807 alleged Japanese B and C class war criminals tried for war crimes in trials conducted by Australian military courts between 30 November 1945 and 9 April 1951. The trials were conducted at eight venues, Labuan, Wewak, Morotai, Darwin, Singapore, Hong Kong, Manus Island and Rabaul. Of those charged 579 were found guilty on one or more charges and 137 were sentenced to death and executed. In Rabaul, Tashiro Tsunesuke who had been in Australian custody for some months was one of those placed on trial for committing a war crime. He was charged under the heading Violation of the Laws and Usages of War, and the charge was that at Kieta-Soloman Islands in or about the month of March 1943 he ill treated Kerosin, a native resident of Buka Island by beating him with his fists and an axe handle. Strangely, the complaint by Kerosin was made one year after the war was over. During the trial, which took place in Rabaul from 7 to 16 July 1947, evidence showed that the defendant Tashiro did all he could to protect natives and Europeans from ill treatment by the occupying Japanese forces. In Rabaul, he protected the interests of the mixed races and the Chinese. Based on the evidence given by Kerosin and other witnesses both for and against the defendant, the court found Tashiro guilty and sentenced him to 10 years in prison. The question that has to be asked is not so much whether Tashiro was guilty or not of beating Kerosin, but why the sentence was so manifestly excessive for ‘ill treatment’. Other Japanese had been tried for torture, whippings, beatings, failure to provide medical care and treatment, food and so on, and many received only 1 to 3 months in addition to the time they had already spent in Australian custody. In the transcripts of his trial there is no mention whatsoever of his involvement with the Black Dogs nor was there was there any evidence presented of spying activities by Tashiro. The prosecuting officer, possibly trying to influence the court early in his cross examination, did ask Tashiro if he had been a Japanese agent spying in the Bougainville and Rabaul area. Tashiro denied the accusation. Both Read and Mason were of the opinion that Tashiro was some sort of Intelligence agent prior to the war but nothing has been proven to date as to whether or not he was engaged in intelligence work. The Judge–Advocate General reviewed the trial proceedings and the petition for a sentence reduction in light of the accused character references on 28 October 1947. He observed that while there was evidence before the court from which the court could have arrived at the finding of guilty and while it was not his ‘province’ to substitute his own mind for that of the court, he could not help ‘avoid expressing the view’ that he would ‘not have found the accused guilty on the evidence.’  So why was the court so heavy handed with the Tashiro’s sentence? Was Kerosin telling the truth or was there a hidden agenda behind the allegations he made 12 months after the war was over. He was extremely loyal to Stewart and may have thought removing Tashiro was a good move in case he came back and the business rivalry began again. Although only conjecture, there are two possible explanations as to why the court took the action it did. The first is that with the memory of Japanese war atrocities still raw in the public memory, the court may have been under pressure from the press and the public for not being harsh enough with the prison sentences being given to Japanese war criminals and Tashiro was simply an unfortunate victim of that public pressure. In fairness this public pressure could be equally applied to those Japanese given more lenient treatment. Secondly, the complaint of the ill treatment of Kerosin may have been a very convenient way to punish Tashiro for other crimes that the authorities did not have sufficient evidence to charge him with. After Tashiro had been sentenced, there were moves based on Tashiro’s character references to have his jail term reduced. Not everyone agreed with any sentence reduction. The Head of the Catholic Sacred Heart Mission in Kokopo in New Britain, Bishop Schumach, visited Read and said he had heard of the controversy associated with the Tashiro case and said he was contemplating getting the case reopened. Would Read be prepared to come forward and give evidence? Read told the Bishop that he would be prepared to tell all he knew on the matter. Some time later, the Bishop wrote to Read saying that the sentence had been reduced and he considered it now inadvisable to proceed with reopening the case. Tashiro’s sentence had been reduced to 5 years on 13 January 1948. Jack Read met a mutual Bougainville friend Fred Archer after the war crimes trials were over and in conversation Archer said that he had met a Colonel Smith who was on the war crimes trial of Tashiro and had boasted of having gaoled Tashiro. Archer also met Captain Watt, who was also present at the trial, who had said that it was his opinion that a great injustice had been inflicted on Tashiro. Most Japanese who were sentenced to terms of imprisonment by the Australian War Crimes Tribunal served their time initially in the Number One Australian War Criminals Compound in Rabaul. They were later transferred to Manus Island and used as labour to clean up war damage and restore the island to some resemblance of its original condition. Tashiro was repatriated to Japan in February 1952 while on 11 July 1953 the remaining prisoners embarked on the SS Hakuryu Maru and were returned to Japan. There they were to serve the remainder of their sentences in Sugamo prison near Tokyo in an agreement between the Australian and Japanese governments. As for Tashiro, there remains the question based on available documentation, as to his actual innocence or guilt for the crime he was charged with or the crimes he was suspected to have committed will most likely never be known. In Eric Feldt’s book The Coast watchers and Walter Lord’s book Lonely Vigil (The Viking Press, 1977), both mention the name Tashira as being the instigator of the Black Dogs. It would be very unusual for a surname to be Tashira, therefore the ‘a’ is a typographical error and should read Tashiro. A few other historians writing on the subject also mention Tashira. When the Japanese invasion of the Pacific Islands began, most of the isolated sections were either overrun or forced to retire to safer locations. Many of the men at Kavieng attempted to escape by sea but were captured and taken to Rabaul. More than 130 of the NCOs and men were killed when the American submarine USS Sturgeon sank their prison ship, the Montevideo Maru, enroute to on Hainan Island located at the southern end of China on 1 July 1942. McNab, Alexander. We Were The First. The Unit History of No 1 Independent Company. Page 149, Bougainville Section 3, Behind Enemy Lines. Australian Military History Publications, 1998. Iwamoto, Hiromitsu. “The War in Relation to Japanese Settlers in Papua and New Guinea”. South Pacific Study, Vol 17, No 2, 1997. It is not known who ordered the execution. Japanese version of the German Gestapo. Des Martin. E-Mail to author. Read, Jack. Coast Watcher 1941-42. His Bougainville Reports. Papua New Guinea Printing Company Ltd. Port Moresby, 2006. Stewart, Robert. Nuts to You. Wentworth Books. Sydney, 1977. Pages 156-7. Kerosin was the name used during the War Crimes Trial but other documentation has his name as Kerosene and Kerasin. The author has maintained the name used in the trial reports. National Archives, Melbourne. Series B5569/1 Box 12 container B863744. War Crimes trial of Tashiro Tsunesuke. Australian War Memorial, Canberra, Act, Australia. Dr Narrelle Morris, Research Fellow, Asia Pacific Centre for Military Law, The University of Melbourne, Melbourne, Victoria, Australia. Professor Tim McCormack, Asia Pacific Centre for Military Law, The University of Melbourne, Melbourne, Victoria, Australia. Des Martin, Field Staff Officer, 6 Division, AIF, PNG, 1944-45 Aitape-Wewak campaign. Albert Kinani, Bougainville Tourist Development Office, Buka, Bougainville. Alexander [Sandy] McNab, Frankston, Victoria, Australia. Andrea Williams, Editor; Papua New Guinea Association of Australia. Keith Jackson, PNG Attitudes Blog page. http://asopa.typepad.com Donald Hook, Canberra, ACT, Australia. Emeritus Professor James Griffin, Spence, New South Wales, Australia. Dr Geoffrey Gray, Research Fellow, Australian Institute of Aboriginal and Torres Strait Islander Studies, Canberra, ACT, Australia. Emeritus Professor Hank Nelson, Division of Pacific and Asian History, Australian National University, Canberra, ACT, Australia. Judith Fairhurst [neé Read], Ballarat, Victoria, Australia.